STACK tracks down some of the best pictures on the Internet of professional athletes wearing their own shirts. Athletes can be cocky. It isn't really their fault, though. Being better than 99.9 percent of the population at what they do warrants a step up on the pedestal. Here at STACK, the amount of growth in visitors to our website on a monthly basis has been extremely steady. But if one morning we woke up and our audience had tripled, well, we might be a little cocky about it too. But recently, the egotism has stretched to new levels. Top-tier athletes are putting their faces, logos and catch phrases on their shirts, and then wearing them in public. 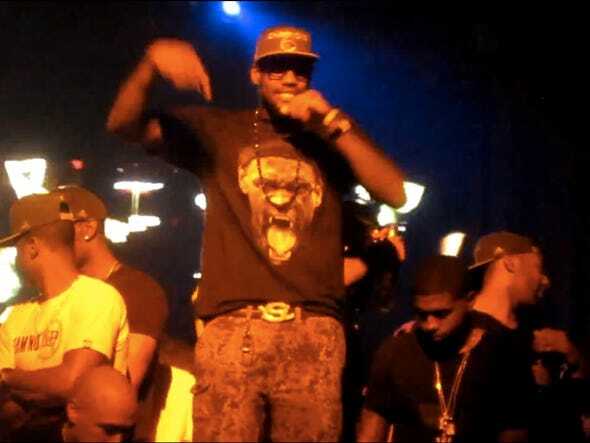 Not sure if that's LeBron James standing in the corner of that dark Miami club you're in? Just look at his shirt. Hey, is that Chad Johnson by the pool? It sure is. He's wearing a "child please" shirt. 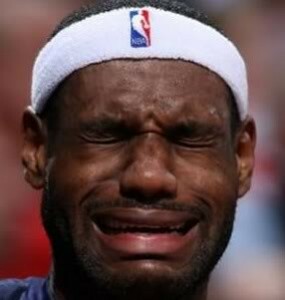 Here's a short list of professional athletes who love themselves just a little too much. The reigning rookie of the year snapped this photo of himself wearing a "Kyrie Never Stops" t-shirt, Nike's play on its original "Basketball Never Stops" campaign, which debuted during the NBA lockout last summer. While Irving's outfit might serve as a helpful reminder to keep pushing when he gets fatigued on the court, it could also prove dangerous on road trips. "Wait, did I pass my exit? Should I stop here? Where am I?" Chad Johnson was famously cut from the Miami Dolphins earlier this season, but not long ago, he was the star receiver for a potent Cincinnati Bengals team. He caught touchdowns, riverdanced and coined one of the best phrases of the modern era with, "Child, please." It was a term that that turned away ridiculous statements at the door. For example: "You think you can make a better eggplant Parmesan than me? Child please." Unfortunately, that phrase lost a bit of its luster when Johnson put it on a shirt next to a picture of his own face, and started wearing it around. Child, please. "Honey, why aren't you wearing your wedding ring today? Are you mad at me? Did I do something wrong? Was it the tuna fish I made last night?" Here is Kevin Durant, reigning NBA scoring champ and avid pizza roll enthusiast. While promoting a pair of his signature kicks, Durant rocked this t-shirt featuring a cartoon version of himself riding a bicycle, since Durant is still in elementary school. Durant's cartoon head is enlarged, and the smile his 2D avatar is wearing on the t-shirt is almost an exact replica of the big old' grin the real Durant is flashing in the photo. It's weird. At first you might be like, "Aw, that's cute. He's so happy!" but then you might be like, "Wait, this is weird, why can't I stop looking at it?" and then every time you close your eyes, cartoon KD will be smiling creepily back at you. There is an overwhelming sense of redundancy watching Roger Federer play tennis or speak to the media while wearing a t-shirt with his initials on it. When you've won the most majors in the history of people using racquets to smack green balls at each other, people tend to know who you are. Although sometimes, from a certain angle (a 47-degree angle, to be exact), Federer resembles John Mayer. And you never want to go through life having people mistake you for the guy that broke up with Jennifer Anniston, and who sometimes looks like this. After defeating the New England Patriots to vault themselves into the AFC Championship back in 2010, the Jets' Bart Scott famously told ESPN sideline reporter Sal Palantonio that he couldn't wait to head to Pittsburgh to play the Steelers the following week. The Jets lost that game, and they've been waiting to get to the Super Bowl ever since. But Scott's "can't wait" soundbite went viral, and pretty soon the phrase was every frat boy's response to the question, "Want to take our shirts off and fit as many of us into the back of a pickup truck as possible?" So Scott capitalized, dropping a line of t-shirts with the phrase attached. He even gave one to Baltimore Ravens running back Ray Rice, who can't wait to get out of this awkward photo next to this guy who looks like what a turtle might if it didn't have a shell. Why say something if you can wear a shirt already saying what you'd say? 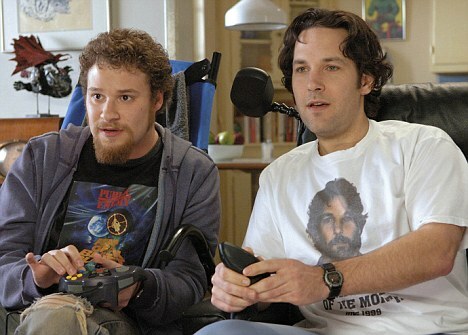 LeBron James is the Paul Rudd of wearing his own face or name on a t-shirt. It doesn't matter what the occasion, LBJ has a shirt with his face on it ready to go. Winning the MVP award? There's a poorly-rhymed shirt for that. Winning the NBA championship? There's a face shirt for that, clearly inspired by LeBron's love of Twilight. Winning a gold medal in Beijing? There's a "this is exactly what I look like right now!" face shirt (pictured below) for that. And another one! Presumably, LeBron James will continue to win things. He did predict 400 Miami Heat championships, after all. This can only mean that more face shirts will surface, and that LeBron James will wear them proudly on his chest. We can only hope that this face makes it onto his next t-shirt.